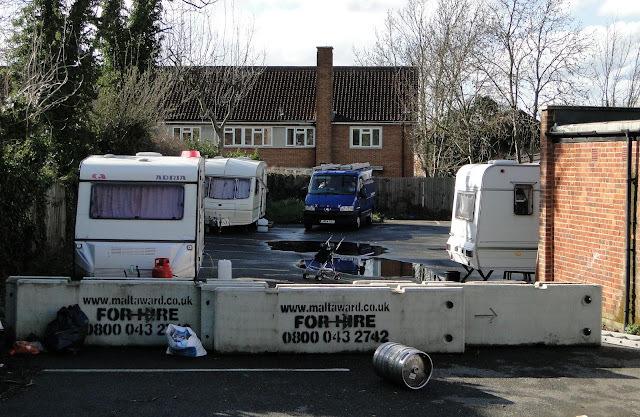 Travellers in caravans have moved into the car park behind the old Worcester Park Tavern. 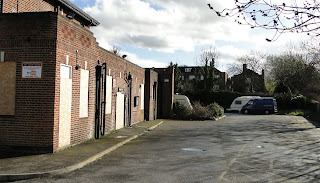 The group with at least 4 caravans drove onto the site just after half past eight on Tuesday morning (16th April) and according to one witness, drove up to the fence, pulled it open and drove their caravans in, all in the space of about 25 seconds. The Worcester Park Tavern has been closed since August last year in spite of a popular local campaign to save the pub and has since become a derelict site. One member of the caravan group, which is all an extended family of Irish travellers told the blog that they had spoken to the site security guard and should only be staying there for a few days and were making an effort to keep the area clean and tidy. So far they seem to have sort of kept the area reasonably clear and when pressed said they are planning to move on again early next week. They were also keen to point out that there are many groups of travellers around and it was quite normal for them to set up in a place like this. They also mentioned how nice the high street was and how pleasant the local people were. All very well but I do find myself wondering how much council tax they pay to use the same services that the rest of us use. The police are believed to have paid them a visit a couple of day ago but it seems this was because a couple in one of the caravans was having a domestic which got a bit out of hand. They weren't there to move them on. I wonder if they will stay true to their word and move on early next week.